He was on his way from his native Minnesota to St. Louis, the city he calls home during the NHL season, in preparation for the start of the 2011-12 campaign. For Backes, coming off a brilliant season in which he scored 31 goals, the journey brought back memories of his high school hockey days at Spring Lake Park in Minnesota. Selected in the second round, 62nd overall by the St. Louis Blues in the 2003 NHL Entry Draft, Backes, who was recently named the captain of the Blues, played three seasons of college hockey at Minnesota State University, Mankato, where he was named to the 2005-06 Division I West All-America Second Team and the 2005-06 All-America First Team. Assigned to the Peoria Rivermen of the AHL for the final 12 games of the 2005–06 AHL season, Backes remained with the team for the start of the 2006–07 season, but was promoted to the Blues for his first NHL game on December 19, 2006. Skating against the Pittsburgh Penguins, Backes assisted on a goal by veteran Doug Weight on his first NHL shift. In his second game, he recorded his first NHL goal at 10:47 of the first period versus the Los Angeles Kings. He completed his rookie campaign with 23 points in 49 games with St. Louis and 13 points in 31 games with Peoria. In 2007–08, Backes completed his first full season in the NHL, notching 31 points on 13 goals and 18 assists. He became a restricted free agent in the off-season and signed a three-year, $7.5 million offer sheet with the Vancouver Canucks. The Blues quickly matched the offer to keep Backes in St. Louis. Backes netted 31 goals and 54 points in 2008-09, finishing second for the team lead in goals. He scored a career-high four goals on April 2, 2009, in a 5-4 win over the Detroit Red Wings. In 2009-10, Backes recorded 17 goals and 31 assists for 48 points in 79 games. He signed a five-year, $22.5 million contract extension, which will keep him in St. Louis through the 2015-16 season. Last year, the 27-year-old scored 31 goals and had 62 points. In the five seasons he's been with the Blues, Backes has only been to the playoffs on one occasion, 2006-07, a first-round exit, in four games, at the hands of the Vancouver Canucks. Including the addition of a player Backes is happy to have on his side. 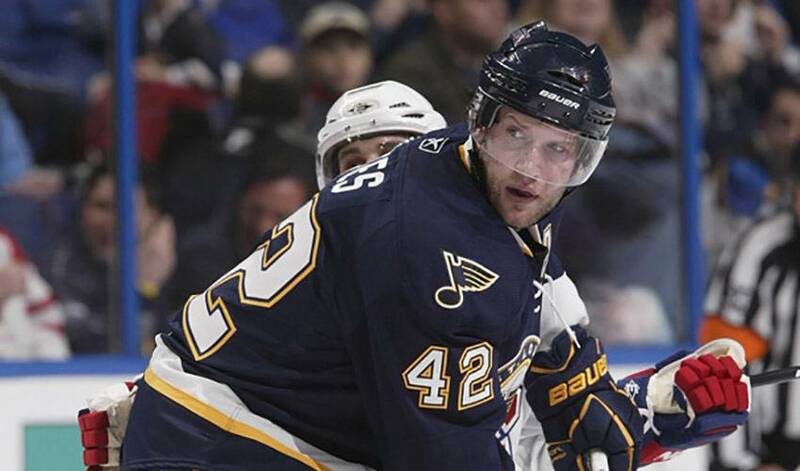 Backes is looking to build off his own strong season. But, as he notes throughout the conversation, a post-season berth is all that truly matters. A road, Backes hopes, that ends with a return to the Western Conference playoff scene.